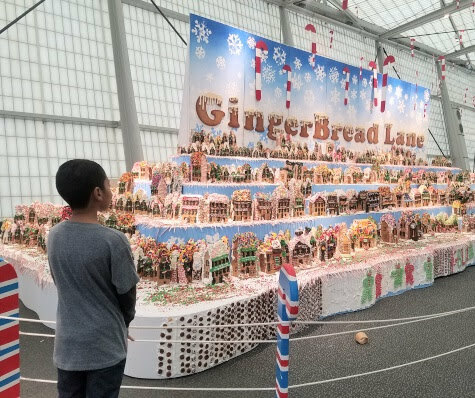 To get into the holiday feelings we visited the New York Hall of Science to see the Guinness World Records holding "GingerBread Lane" exhibit, before taking workshop to make our own GingerBread Lane house. Note: I was invited as media and received tickets for review purposes. I paid for the workshop myself. Views expressed are always 100% my own. Every year, creator Jon Lovitch designs, bakes and decorates all of the structures for GingerBread Lane in his home in Queens, N.Y. Part of the fun of GingerBread Lane is seeing the various ways that candy is used to decorate the houses: pieces of gum become brick walls, candy canes become railings on staircases, and M&M’s, candy corn, jelly beans, and Necco Wafers become colorful rooftop shingles. This year’s GingerBread Lane includes a number of storefronts with quirky names: Pickles and Ice Cream Pregnancy Boutique, 8 Maids a Milking Dairy and Milk Bar, 6 Geese a Laying Brunch Café, 5 Golden Rings Jewelry Store, The Well Dressed Gingerbread Man Flannel Pajamas, I Saw Three Ships Custom Built Sailboats, and Deck the Halls Holiday Decorating Service. GingerBread Lane is the record-holder of the Guinness World Records for largest gingerbread village. 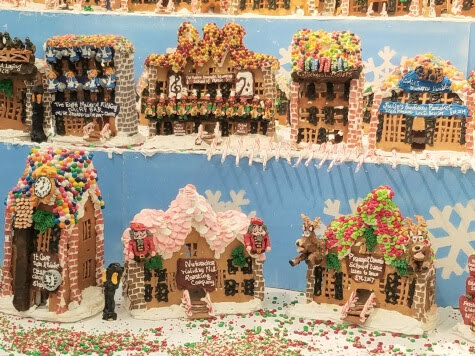 In order to be eligible for the title, every element of the gingerbread display must be edible, and the display must imitate a village with houses, shops and town services such as a firehouse and police station. I'd say that Lovitch did an amazing jon once again! After visiting the GingerBread Lane exhibit, we were excited to make our own creation "GingerBread Lane Workshops". 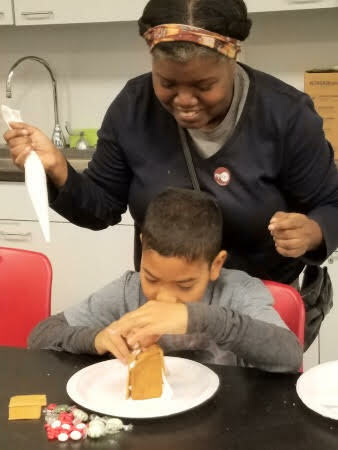 In the workshop you can make your own gingerbread houses or trains. Worried it might be hard? It really wasn't. 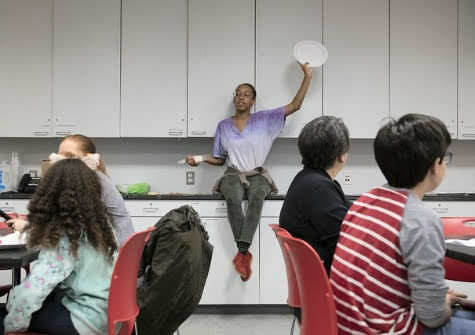 The workshop leader provided all the supplies and walked you through step by step during the making process. 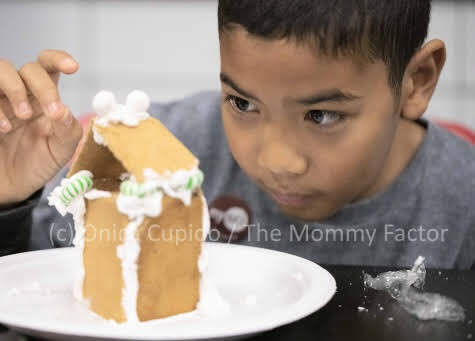 The idea of us taking the workshop was for my son to have the experience of making a gingerbread house. But I ended up "helping" him more then working on my own gingerbread project. But I didn't mind since we both had so much fun making it. I hoped we'd finish the project but my son kept eating the icing and candy topping. That didn't help our house be very sturdy and in the end it didn't stick together. But again we had so much fun we didn't really mind. We instead, we enjoyed seeing everyone creation, which is just as good right? As my son continued to snack. Shaking my head. If you'd like to see the "GingerBread Lane" exhibit or join the workshop, visit New York Hall of Science! 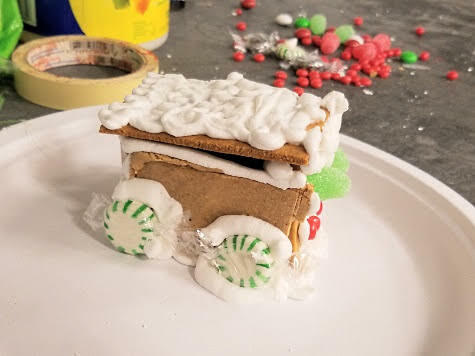 Museum visitors can take home a piece of GingerBread Lane. Gingerbread houses will be given away on a first-come, first served basis until every piece of GingerBread Lane is gone. Free with museum admission.